A prominent feature in the west of Amsterdam, the Westergasfabriek is one of the city’s thriving creative hotspots. There’s always something going on at Westergasfabriek, the buzzing creative complex at Westerpark. 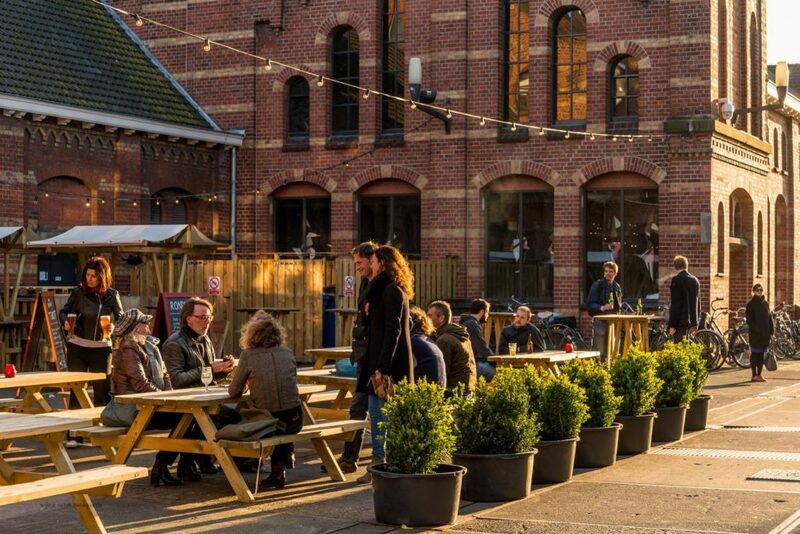 Once the city’s gasworks, this collection of former industrial buildings is now one of Amsterdam’s most exciting and vibrant creative hubs, and home to a variety of bars, restaurants and entertainment venues. Westergasfabriek hosts a busy schedule of exhibitions, food markets, festivals and cultural events, so you’ll always find something new to discover. 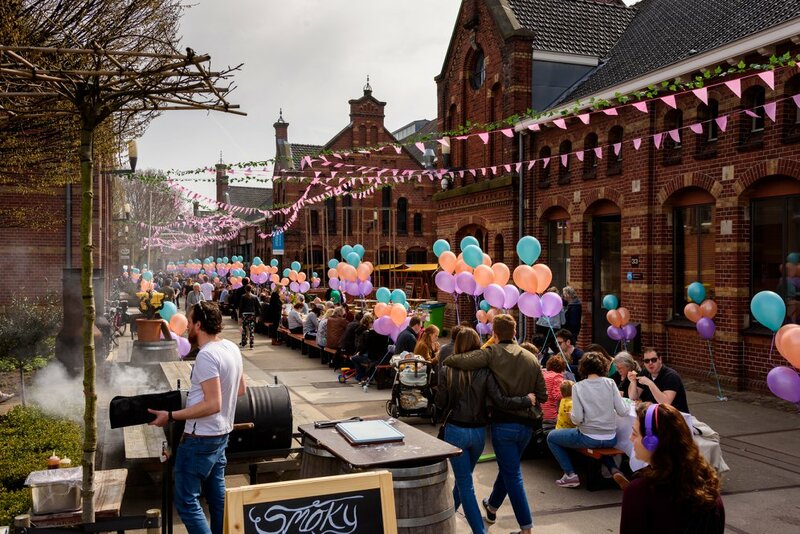 One of the most characteristic event venues and recreational areas of Amsterdam, minutes away from the city centre, is popular for its festivals, exhibitions and markets, such as the Sunday Market and NeighbourFood Market. Westergasfabriek houses a large number of attractive shops, bars, restaurants and nightlife with a contemporary offering. Perfect for a relaxing afternoon or exciting evening and night out. Would you rather escape the bustle of the city? 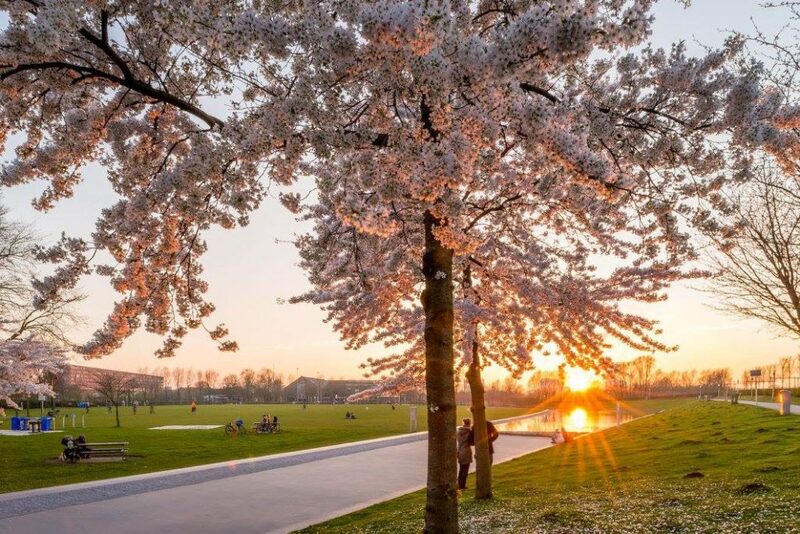 Then find a nice spot in the grass of nearby Westerpark and enjoy the silence. Together the Westergasfabriek and the Westerpark are an iconic location in Amsterdam West. It is the place where people gather on weekends or sunny days. Relax on the gras or waddle a little in the water at the park to cool off. When it comes to eating, you have a lot to choose from at Westergasfabriek. Immerse yourself in oriental atmospheres in nomadic restaurant Rainerai or enjoy excellent cocktails and seafood at Mossel & Gin. Nearby, Pacific Park is an interesting rock ‘n’ roll bar and restaurant. Enjoy your favourite bands and the interesting menu four days a week. Raïnaraï is the nomadic restaurant with an Algerian kitchen. Chef Laurent Khellout is the master of this kitchen and surprises guests with tasty treats and thrilling dishes. Cant choose? We recommend ordering the Malika, Zineb or the Mechèwe. Are you a film fanatic? A little further down the road, Het Ketelhuis is Amsterdam’s only open-air cinema with an attractive program featuring art-house films, classics and blockbusters. Ton Ton Club brings you back to the seventies and eighties; this arcade is worth visiting with friends. Pacific Park has live music nights and is one of the best places to have a drink! Besides that the Westergasfabriek is alo home to the Gashouder, one of the event locations. Many festivals and conferences are held here throughout the year. One of the must famous events in The Gashouder are the indoor Awakenings Festivals, during these nights house-fanatics gather to party into the early hours. But it is not the only festival held at the Westergas-grounds. Far from it! 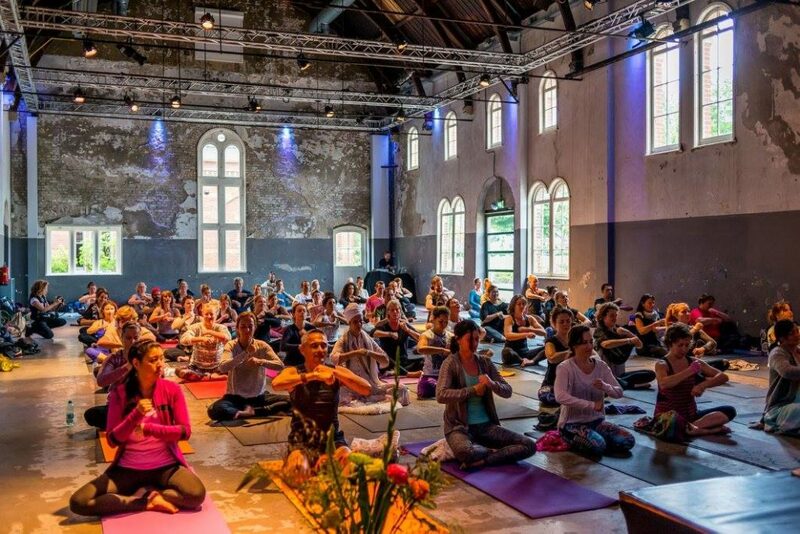 Almost every weekend there is a new event at the Westergasfabriek. From various food festivals such as the vegan food festival, film festivals, sneak previews, Milkshake festival, Art festivals, the monthly Sunday markets and many other events this is really the place to be in Amsterdam west. If you always want to be up-to-date with the latest info on events at the Westergasfabriek keep an eye on their Facebook page. Espressofabriek is a quintessential specialty coffee bar. Espressofabriek was one of the first venues to open in the Westergasfabriek area – and the first specialty coffee bar in the Netherlands. Freshly roasted coffee plush amazing baristas means great cups of coffee! One and a half years since the opening of the first brewery, Brouwerij Troost recently opened a second venue at the Westergasfabriek area. At this location, Troost can brew larger amounts of beer and will be able to bottle the beers, so you can even take them home as a unique souvenir.